Day 20: Make a Year-End 2018 Donation by Monday, January 31! We know our mission and our work is as critical now as it has ever been. We know it’s going to take all of us. It’s going to take YOU. Your 2018 end of year donation will sustain YWCA Olympia’s commitment to supporting and empowering the individuals who come through our doors each day, as well as our efforts to advocate for systemic change to make our local, state and national community a more equitable place for all. Day 19: How much do you spend on a coffee / tea / chai each morning? If you set up a Recurring Monthly Donation of just $5, you’d be raising $60 for YWCA! Our secure donation processor helps you it up online! How easy is that? Day 18: Join one of our 2019 Book Clubs. Drop us a line at ywca@ywcaofolympia.org and let’s get you set up with our first book! Day 17: Attend one of our Events! While we don’t have everything on the website calendar yet, you can start planning now for Womxn of Achievement in the fall and the Mission Impact event in early summer (we’re trying something new, stay tuned!). And in 2019 we are excited to invite you into our racial and gender justice work work in a new way that will ask you to dig deeper. Make sure to follow us on social media for all the alerts! Day 16: Want to contribute in recognition of family, friends, loved ones, or in honor of a special occasion like a milestone or achievement? We have several opportunities, including beautifully personalized commemorative bricks that line the path to the door of YWCA. Bricks are $150 and all proceeds help maintain the Kearney House, home of YWCA Olympia since 1948. Contact Cherie at 360.352.0593 for more information. Day 15: YWCA’s Youth Action Board is collecting donations for the Northwest Detention Center to provide human dignity to the 30-40 detainees who are released each week with their belongings in clear plastic bags. YAB is looking for 17″+ size backpacks (empty, please). They are also collecting individually wrapped snacks, chips, nuts, bottles of water, canned soda and travel size toothpaste and deodorant. Bring your donations to our offices Mon – Thurs 9-4 or Fri this week until 3. Day 14: We love your donations of products to The Other Bank. In fact, 98% of what is distributed to the community is from you. But, did you know that we have many other costs associated with running the Bank? Our power bill (heating and lights) runs a little over $110 each month. Could you take one month? Day 12: We STILL have 5 families left to adopt as part of this year’s The Olympian annual listing of organization needs. Are you able to help? We are open Mon-Thurs 9-4 and Friday from 9-3 this week and we’d love to see you. Day 11: Get active in raising awareness about Advocacy and Public Policy. Civic engagement, community forums, speaking to your legislators, calling your representatives (repeatedly, if needed), voting. YWCA takes an inclusive and intersectional approach to our advocacy, recognizing that equity and opportunity for girls and womxn are directly impacted by the compounding impact of race, ethnicity, gender, and socio-economic factors on their lived experiences. We are also cognizant that progress for womxn and girls must be in alliance with our LGBTQ+, immigrant, and other marginalized/vulnerable communities. 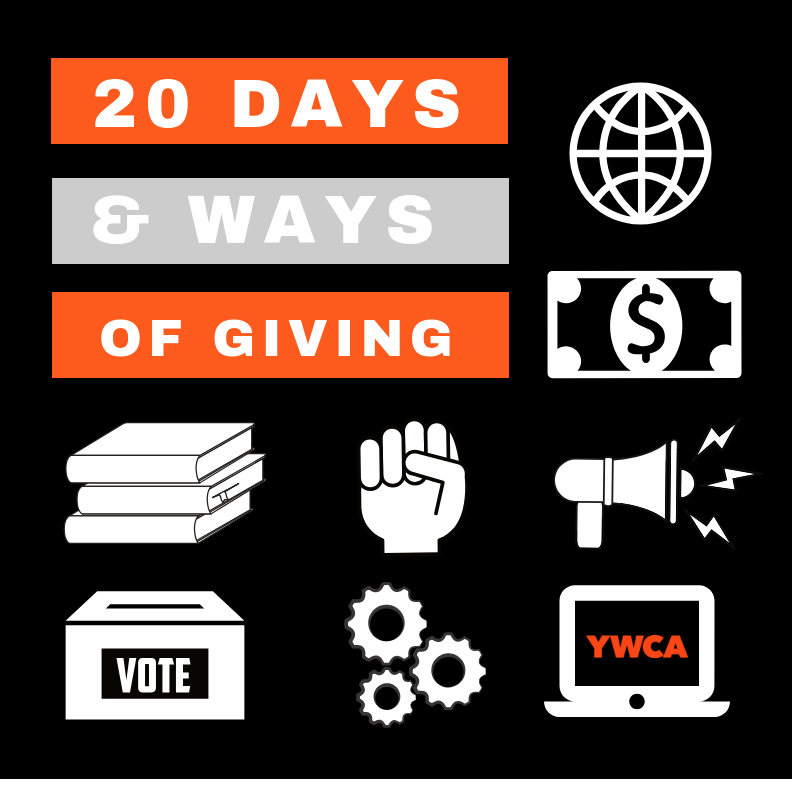 Day 10: If you are able, stock gifts are a great way to invest in YWCA, while also accessing substantial tax benefits. Call us at 360.352.0593 for details. Day 9: Planning on doing some shopping online? When you shop, Amazon gives to YWCA. Amazon will donate 0.5% of the price of your eligible AmazonSmile purchases to YWCA Olympia whenever you shop on AmazonSmile. Choose YWCA Olympia(currently listed as “Young Women’s Christian Association”) and start shopping and start donating! You can also create a shortcut to AmazonSmile which will automatically direct your donation to the agency. Day 8: Make YWCA part of your Legacy Giving. If you are able, you can make a lasting gift to help YWCA meet our long term goals. This could include a gift in your will, beneficiary designations or distributions from an IRA. We’ve been here in Olympia for 75 years and you can be part of the next 75 and support the fight to eliminate racism and sexism, empower womxn, support families, strengthen communities and work for justice, freedom and dignity for all for generations to come. Click for details. Day 7: Speaking of social media, Did you know that Facebook has a way for YOU to set up a donation page? And the fees are covered so every $ donated comes to YWCA! Day 6: Follow us on social media. We are on Facebook, Twitter, Instagram.…share our posts, share YOUR Y-Story. Join us using our hashtags for #YWCAOlympia, #GiveLocalSPS, #GivingTuesday, #StandAgainstRacism, #YWCAdvocates, #YWCALeadership, #YWCArchiveProject and more. Inspired or angry about something we post? Like it, share it with your comments. Day 5: Are you a Fred Meyer customer? Did you know that you can link your Rewards Card directly to YWCA Olympia? You can direct your donation while picking up veggies and bread! #EV227 is our number or you can look us up by our name….and you can link your Reward Card HERE! Day 4: Attend our next YWCA Volunteer Orientation on January 29th! Click to RSVP! Day 3: We are proud to be part of the Washington State Combined Fund Drive! Our CFD #0315497 can be used for your generous check or payroll deduction. Day 2: Ask your friends and colleagues to join you! Instead of birthday, shower or other occasion gifts, how about asking everyone to make a donation to YWCA Olympia instead? One of our 2018 favorites? Soup Nights! A Holiday Party, perhaps? You can collect donations and bring to YWCA and we’d love to give you a tour while you are here! Your guests could also donate online as well. Day 1: YWCA is featured in this year’s The Olympian annual listing of organization needs. We have 5 participants remaining on this list. Are you able to help? We are open Mon-Thurs 9-4 and we’d love to see you. Big Changes Ahead for The Other Bank! Kathleen’s Closet Now Accepting Donations!